This Sterling Silver & Multi-Stone Inlay Bolo Tie features the elegant color combination of inlaid Black Jade, Picture Jasper, and Turquoise. 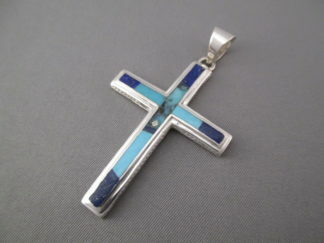 Hand-made by Native American jewelry artist, Charles Willie (Navajo). Bolo comes with a 43″ braided black leather tie with sterling silver tips.